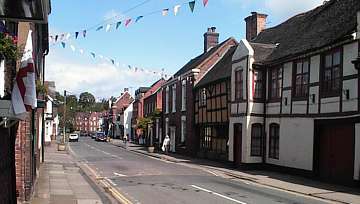 Kinver is a beautiful village just 5 minutes drive away from Stourbridge. The River Stour that gave Stourbridge its name also runs alongside the village. The existence of the village was first recorded in 736AD as CYNIBRE, meaning "great hill". There is an abundance of fantastic old buildings in and around the village, such as the old Grammar School and the Whittington Inn. Please see photos below. But perhaps even more impressive is Kinver Edge, three hundred acres of national trust land within easy walking distance of the village itself. Kinver Edge, like nearby Clent Hills, was once the nearest thing Stourbridge people had to a holiday, if you had no money, you walked it, if you had some money, you took the tram! The tramway started in Amblecote, Stourbridge and travelled though lovely scenery to the village of Kinver itself. Sadly the tramway was removed many years ago, today only grandparents remember it. In time we may devote more of this section to the tramway, meanwhile please contact us if anyone has any recollections of it they would like to share. The views from the top of Kinver Edge are wonderful. It is a sandstone ridge just several hundred feet high, with views out over surrounding fields and woodland. It is easy to imagine this being the inspiration for Tolkein's "Middle Earth" landscape, being a Midlander himself perhaps it was! The soft sandstone is easy to carve and a distinctive feature of the Edge is the abundance of caves and former houses carved from the many rocky outcrops. People lived in these cave houses up to the 1960's. You can walk to Kinver from Stourbridge in little more than hour along Gibbet Lane, or a longer but still very pleasant route is along the canal. It's also a very easy bike ride.